The surface profile measurement by replica tape (Press-O-Film or testex tape) is performed after sandblasting, i.e., SSPC-SP 10 (near-white metal blast cleaning), SSPC-SP 5 (white metal blast cleaning), etc. to make sure the sandblasted surface has the required profile as indicated in the customer coating specification. The test is performed just after sandblasting; the selected spot is cleaned by blowing air to remove loose dust that is the product of sandblasting. Two type of replica tapes is available in the market i.e. coarse and extra coarse.The surface profile measurement almost is a mandatory requirement by most coating specifications. The "Coarse Tape" was made for the surface profile of 0.8 thru 2 mil (20 to 50 μm) and "Extra Coarse Tape" made for 1.5 to 4.5 mil (37 to 112 μm). You should pick the replica tape which is much closer to your customer specification. So if the customer specification requires 2 thru 3 mil surface profile, then you have to use Extra Coarse tape. Remove the cover from the tape and adhere to the surface and rub the little circle (thin foam film) with rounded objects. A swizzle stick comes with replica test package that you can use as a rounded object. Then remove the replica tape and measure the thickness of the circle area (thin foam film) with a calibrated anvil micrometer. Record the micrometer value and deduct from 2 mil (this is foam film thickness). The obtained value from this subtraction is your surface profile. 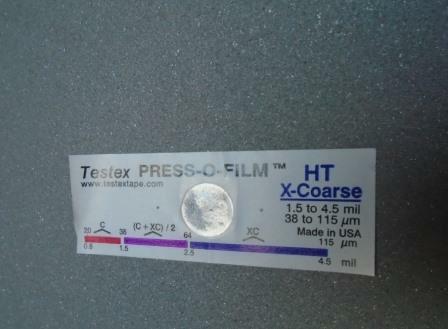 The test should be repeated if the obtained value is out of the range of testex tape (replica test). For instance, if the specification says the required surface profile is 1 - 1.5 mil and you used the coarse film and obtained test result was 2 mil, you need to repeat the test. The replica test is more accurate when the readings (after deduction of 2 mil) falls near middle specified range. For example, if you are using the extra-coarse tape and your test result is 3 mil, you can assure this reading is the accurate measurement. You need to repeat the test with higher or lower grade when the reading is near the ends of the range. 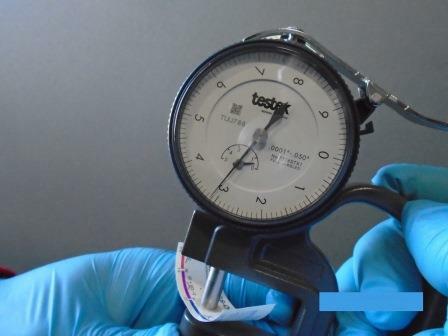 For example, if you are using extra coarse tape and your surface profile measured was 4.4 or 4.5 mil, then repeat the test with coarse tape. 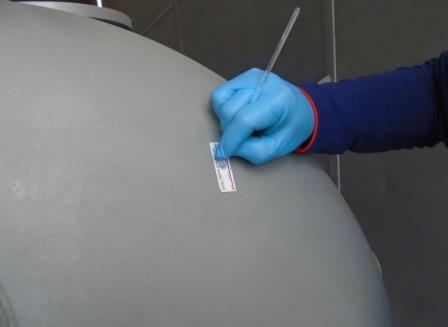 Two standards address replica test (Press-O-Film); NACE Standard RP0287 and ASTM D 4417 Method C. It is imperative for the inspector to witness the surface profile or review the test report. The too shallow surface profile might cause lack of adequate adhesion and consequently cause the paint delamination and blistering. A higher surface profile might also create some problem; the high peak might not be covered with the first layer (primer) and create rust spot. Some paint type also might have some limitation on surface profile, and "too high" surface profile be determinantal for painting process like inorganic zinc silicate primer.